Trail running enthusiasts can fill their shoes with inspiration by following this bearded outdoor enthusiast based in Vancouver, British Columbia. Endurance runner Gary Robbins treats his followers to spectacular scenes of Western Canada, from snow-capped Rockies to lush green forests. This is the kind of stuff to spur any runner into pulling on their sturdy shoes and setting off in search of new trails to train on (or enjoy a relaxing stroll along, at the very least). The man behind the popular Running Addict blog, Niko, is a keen Montreal-based marathon runner. Originally hailing from Normandy, France, he’s a world traveller who always makes sure he has his running shoes with him. This is one Frenchman who doesn’t get cold feet during the long Quebec winter! Check out his Instagram page to see shots of him training for upcoming marathons and half-marathons in Montreal’s hippest neighbourhoods, even in the heaviest of snowstorms! Need motivation to get out there and brave the elements? Follow Niko on Instagram and take a look at his blog! Without a doubt, this 32-year-old Ontario athlete is one of the most recognizable runners in Canada. Lanni holds the Canadian record for the women’s marathon with a time of 2:27:59, and somehow manages to juggle her career as a lawyer and her passion for running. On social media, you’ll find her rocking yoga poses in the studio or hitting the running track with her stablemates on the Canadian athletics team. An unabashed feminist, Lanni’s not afraid to challenge stereotypes and speak out for women in the world of sport. Vancouver native Brendan Brazier is a former professional Ironman athlete, outspoken vegan and bestselling author. Not only is he the cofounder of Vega, a popular line of plant-based health supplements, Brendan also penned the bestselling book Thrive, which promotes the benefits of a vegan diet on sporting performance. As a two-time Canadian 50km ultramarathon champion, he inspires endurance athletes the world over. Check out his Instagram page for stunning landscapes, intense workout sessions and animals of all shapes and sizes! When he isn’t in front of the camera on the set of a homegrown TV series, Patrice Godin runs ultramarathons and trails all over Quebec. A familiar face for fans of the popular TV shows Virginie and La Galère, the actor isn’t scared of long distances and high altitude. Not content with running the Bigfoot 200, a gruelling 205-mile mountain course that took more than 80 hours to complete, he’s planning to push his limits again in 2017 by running a 234-mile race through the Utah desert. Visit his blog for photos of his races and tips on running an ultramarathon! Ontario-based Melissa Bishop is an Olympic athlete and a shining star on the international running scene. The Canadian champion in 2013 and 2014, she broke the Canadian record for her discipline, running the 800m in under 1:57. A self-styled fashionista, she’s a rich source of inspiration for women who are looking to fit out their training wardrobe with gear that’s just as in vogue as it is comfortable. Follow Melissa if you want a peek behind the scenes of the Olympic world, or even if you just need motivation to head to the gym! A long-distance runner from Hamilton, Ontario, Reid Coolsaet is a member of the Canadian Olympic Team. He also has a new baby, proving once and for all that being a dad doesn’t have to put the brakes on living an active lifestyle. As he trains in Canada’s rugged mountains and snowy forests, preparing for the next Olympics, he takes plenty of snapshots of stunning scenery to keep his Instagram followers happy. What’s his greatest passion? Travelling the four corners of the world to run marathons—Japan, Kenya and China, to name but a few. Born in Surrey, British Columbia, Natasha is an Olympic 10,000-metre and 8K athlete (and she holds the Canadian record in both disciplines). Training buffs (and cat lovers) will be charmed by her Instagram page. Yoga, weight training, jogging on the beach, ab work… you name it, Natasha needs no inspiration to stay in shape—and she does it all with such a contagious smile! Coffee and running. Those are the two true passions of Waterloo, Ontario athlete Jessica Kuepfer! She’s an incorrigible sports addict who runs marathons, does triathlons, bikes, swims and even dabbles in adventure racing. 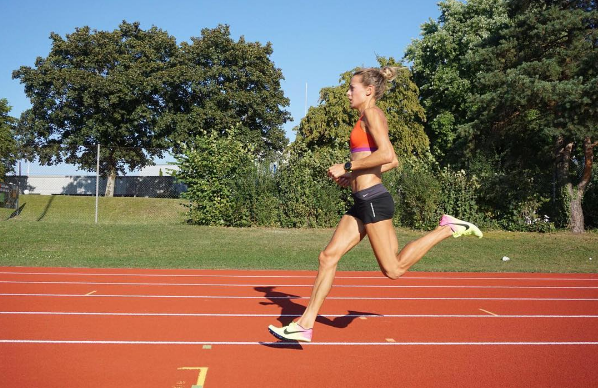 On her blog, she offers insight into her inspiring life from all four angles: training, nutrition, competition and recovery. And the pretty sunsets and action shots on her Instagram page are sure to make you want to go play outdoors! This Canadian trail and mountain runner has a rare talent for photography and loves sharing pics of the jaw-dropping scenery he calls his playground. Following a near-fatal climbing accident in British Columbia in 2016, he has fortunately made a speedy recovery and is now back on his feet again (and his skis). A true lover of the great outdoors, there’s nothing Adam likes more than to scale a summit, pitch his tent there, sleep under the stars and run right back down again. He’s a model of courage and determination for us all!